The eerie clifftop setting of Slains Castle is thought to have paved the way for the creation of Bram Stoker's Dracula and now it has provided the inspiration for a new piece of orchestral music. 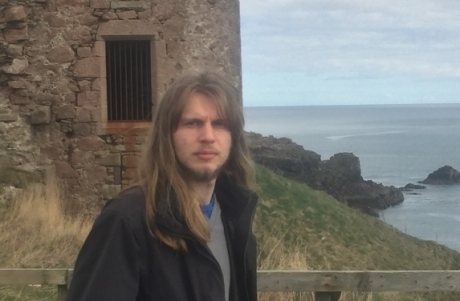 The 16th century ruin, near Cruden Bay in Aberdeenshire, is the subject of a new piece by north-east composer and University of Aberdeen PhD student Joe Stollery. ‘Slains’ will be premiered by the University of Aberdeen Symphony Orchestra and Aberdeen Youth Orchestra on Sunday February 24. Joe, who is originally from Monymusk but now lives in Aberdeen, said: “I have always been interested in local landmarks in the North East, having visited many of those places from a young age. They have strongly influenced my music and ruins and prehistoric sites provide me with a lot of ideas. “When drawing on certain landscapes, I tend to get inspiration from a variety of things involved in these places. As well as looking at what things I can realistically see from my viewpoint such as sunshine, forest sounds, moving water, I also tend to look into the cultural ideas associated with them, and also certain experiences when interacting with them. Writing for orchestra presented Joe with a challenge but he said it also provided greater opportunity to create the climactic moments which Slains Castle and its association with Dracula requires. Joe has been able to dedicate the time to creating the piece thanks to a grant from a Year of Young People Creative Funding award from Aberdeen City Council and he said he was delighted that many of his fellow students were playing a role in the premiere. “I have studied at the University for almost eight years so it means a great deal to me and I know how talented our student instrumentalists are. The first performance will take place at the University of Aberdeen’s Butchart Centre at 5pm on Sunday February 24 following a weekend of rehearsals with the University of Aberdeen Symphony Orchestra and the Aberdeen Youth Orchestra. They will perform together conducted by Chris Gray. The concert is free and people can arrive any time before 5pm.